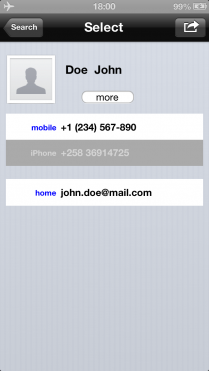 Share your iPhone contacts the smart way. Free Get it & Start Sharing only the contact information you want. 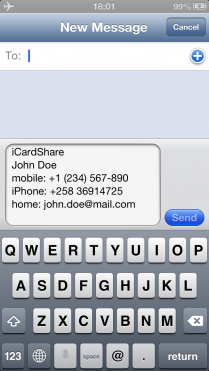 iCardShare allows your to select any of your contacts’ information that you want to share, and put it together, without using tedious copy/paste. If you only want to send someone’s email and phone number, but not their address and special notes that you have, you can easily select what you want and leave the rest! Using our text feature, the contact is converted to plain text, so you can send it to any device that can receive messages or emails. This eliminates the long copy-paste method that was used in the past. You select the contact, the fields you want to share and a text message or email is automatically created. Type the email address or phone number you wish to send it to and you’re done. If you wish to impress and be compatible with any device that can read a PDF file, iCardShare can email a PDF file for any contact you choose. 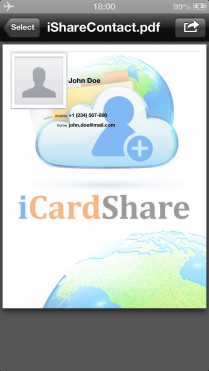 Premium version removes PDF background iCardShare logo. vCard Share works the same way your iPhone has always been sharing your contacts, but you can now select the fields you want to share. 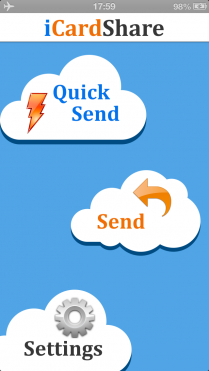 Using our settings you can preconfigure the way you send contacts (PDF/vCard/Text and email/SMS) and send them much faster. This feature is only provided if you have our premium in App purchase. By touching the more button, you can even select if you wish to exclude the name or company fields of your contacts. This feature is only provided if you purchase our premium in app purchase.